Ages 5+ | An amazing 500 Activities! 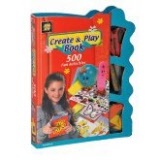 The Create & Play Books are perfect for indoor arts and crafts on a rainy day or compact enough to make it a great travelling companion. AMAV specialise in creating high quality arts and craft and activity kits for children, focusing on kits that will entertain and amuse children for hours, whilst teaching new skills. The 500 fun Activities set contains components for 500 different activities, the ultimate kit for keeping children amused. Contains stencils, small scissors, 6 markers, balloons, stickers, paper... lots to do! Enclosed in a hard back case. 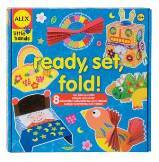 Excellent for keeping children entertained at home or whilst travelling. Includes step by step instructions with illustrations.